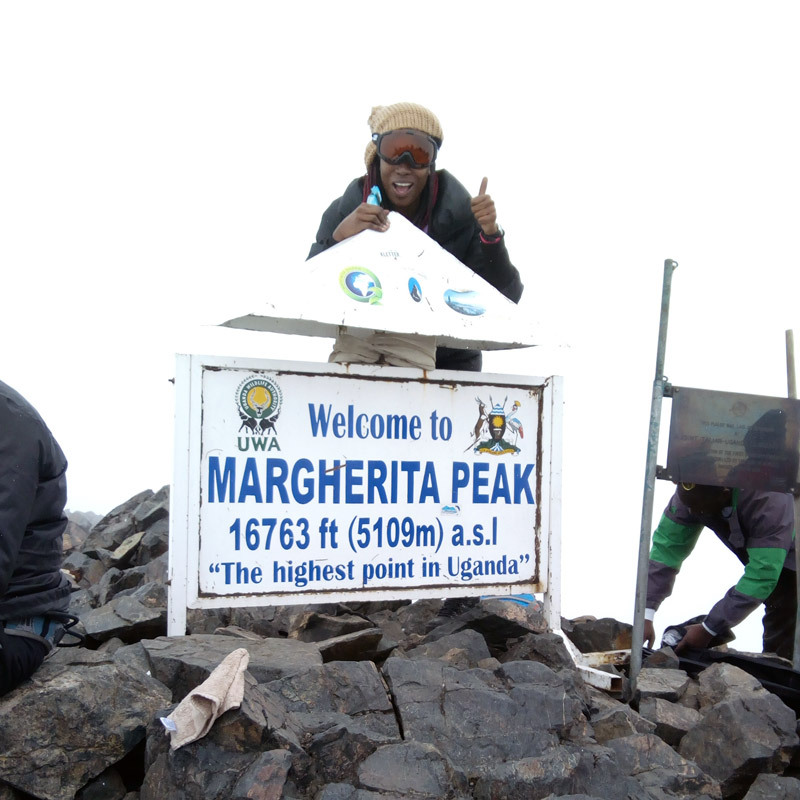 Rwenzori Mountains trekking experience is a worthwhile challenging climb to the peak. My interest and inspiration in the Rwenzori Mountain Range all started a year ago, around August 2016 on one boring Sunday afternoon as I was lying on my bed and lazily flipping over the pages of the Uganda Wildlife Authority Magazine and reading about the various national parks we have in the country. They all seemed interesting, but as soon as I opened the page titled Rwenzori Mountains National Park -The Mystical Challenge, I was extremely fascinated. At that exact moment, I started to envision myself trekking up to get to the famous Margherita peak that stands at an astonishing height of 5,109m. 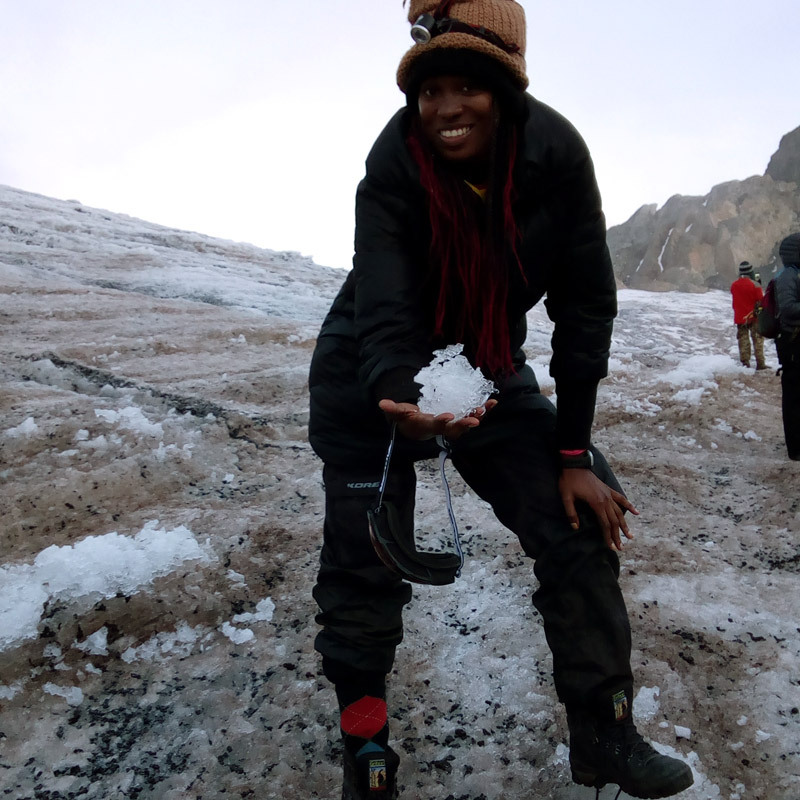 The idea of the highest point in Uganda covered in ice and snow sparked off so much excitement inside me that I knew right away I had to hold the ice in my hands. I spent the next months doing my research on the Rwenzori Mountains. I wanted my dream of holding ice in my hands at the highest point in Uganda to come true. I contacted various trekking services; Rwenzori Mountaineering Services(RMS), Rwenzori Trekking Services (RTS), and compared prices. I read stories of several people who had been up the mountain and I contacted them for their own personal experiences during the trek.From all the responses and advice I received,it was quite obvious that it was going to be a strenuous hike, normally only attempted by experienced mountaineers. I am no experienced mountaineer, but either way, I knew I had to get to the peak. As months went by, I got to know of a club known as the Mountain Slayers Club of Uganda; A group of young energetic men and women with the desire to hike mountains and climb rocks. I contacted the team and agreed to join 14 of them to attempt the great task of conquering the mystical challenge. Due to a few delays our trek started a bit late in the afternoon, with the scorching sun beating down on our heads. 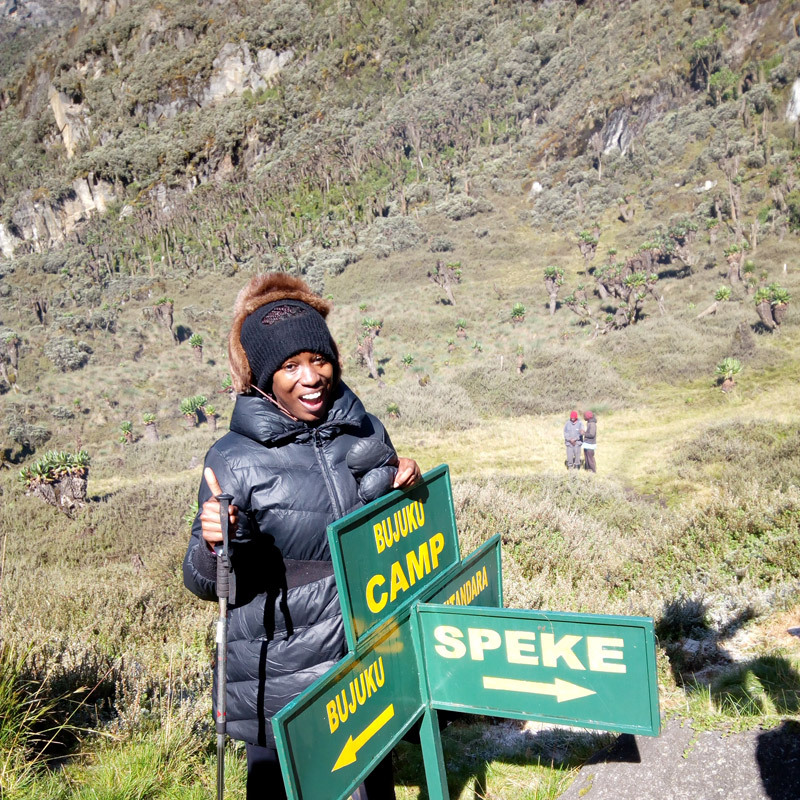 We were introduced to the guides and porters who were to guide us during the trek, carry our luggage and prepare our meals .We were meant to start our hike using the Nkurungu Trail(which had not officially been used before) and this meant we had the honour of officially opening the trail. I stuffed my day pack with energy drinks, chocolates, energy bars, crisps, sanitizers; making sure I had all I needed but that it was not so heavy as to cause me additional fatigue. The trek involved us going up and down a few hills and it was draining as the sun was very hot. We made a few stops under the shade of trees, munched on some energy bars, drank some water and went on trekking for 6 hours until we reached our accommodation for the night at the Kebitakuli camp. It was cold during the night, but fortunately we were sharing tents and had a nice fireplace set right outside to keep us warm. A delicious dinner was prepared and served by the guides and we ate heartily. We cracked jokes by the fire place and the guides briefed us about the next day’s journey and then we went to sleep. Our day started at 6.30am with a warm bath for some of us under some trees and a tasty breakfast of eggs, sausages and bread, washed down with milk tea. This was followed by the day’s 6 hour trek to our intended camp for the night called Kambeho camp at 3700m ASL (Above Sea Level). I found the trek very relaxing with plenty of heather trees, Giant Lobelias and a variety of beautiful flower species and vegetation to marvel at along the way. 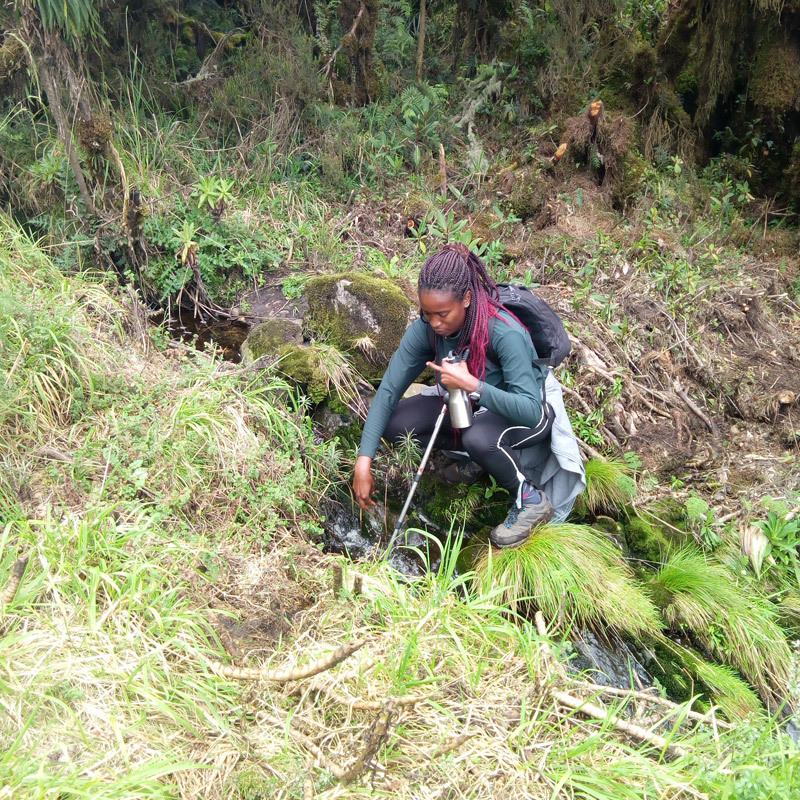 The water flowing down the streams of Mount Rwenzori is so clean, pure and cold.I must confess drinking water from a stream in Uganda is not usually a good idea, but up in the mountains, it´s pure and relatively safe. We had a few breaks for lunch and relaxation during the day which was lovely as it granted me a perfect opportunity to take some memorable photographs. 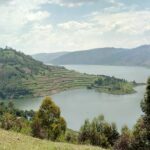 We arrived at Kambeho Camp in a relaxed mood, enjoyed another lovely meal prepared by the guides, swapped some more stories and then retired to bed for the night. After an early breakfast we were off again for a 7hour trek for the day, with a climb along the beautiful river Lhume. The vegetation was spectacular, the sceneries eye catching too and my spirits were extremely high. I had plenty of time pretending to be a diva in front of the camera. This was so much fun so we had our regular breaks for energy drinks/bars and Lunch. 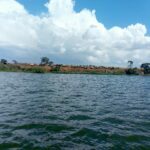 We set camp at Mughuli Lake Camp where we did the usual relaxing by the fireplace, telling stories, cracking jokes, dinner and retiring to bed. This was one of the toughest days during the trek. 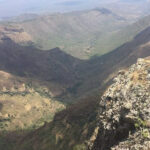 We had two options; either climb the Portal Peak which is 4627m ASL or proceed for a less strenuous 6-7hour trek to the Bukurungu Camp which was meant to be our resting camp for the night. As usual, I love to take on a challenge and I agreed to join the group that went up the Portal Peak. We had to wear gumboots as the ground was boggy and I found myself sinking into it several times. Luckily for me, my personal guide Denis was always by my side, front or back to hold me at my weakest moments. Going up the Portal Peak was a very steep rocky climb for all of us and extremely energy draining as well. I had to mix lots of glucose in my water to keep my body going. It was a long devastating climb, I remember asking Denis several times if we were almost getting to the top and he always responded with“Just a few minutes Madame”, but these few minutes turned into hours and I eventually stopped asking. We finally got to the top but felt battered. 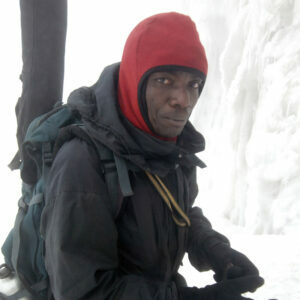 I could easily compare the Portal Peak trek to going 10 rounds with Moses Golola (a famous Ugandan Champion Kick Boxer). Not that I have tried kick boxing before – or would want to, but Portal Peak could easily be described as a fight that you’re fortunate to survive. Going down the mountain was quite difficult too and I felt it was one of the greatest challenges of being tall.My knees felt weak and if it wasn’t for the knee braces that tightly held my knees in place; I suspect my knees would have given way. We got back to Bukurungu Camp relatively late and had a shower, dinner and went straight to sleep. I was too exhausted mentally and physically for any chit-chat with the group. After breakfast we were out again, this time for an estimated 5-7 hour trek to the Bujuku Hut where we intended to sleep for the night. My mood was a bit low this morning. I am an introvert and extrovert at the same time (yes I am as confusing as that sounds). I am naturally very friendly and outgoing but I value my personal space considerably as well. Being around the 14 other members of the group all the time was starting to frustrate and irritate me and I craved for some alone time. I wanted time to mentally reflect, think and derive energy from within. Sadly the group later misinterpreted this act as a selfish one, which is truly wasn’t, but I can’t fully explain myself to other people all the time – more so when my full focus was on conquering the Mystical Challenge. I was getting irritated with the constant muddy, boggy terrain and I’m certain my personal guide Denis noticed the look of disgust on my face. He surprised me when he asked me to follow him to a route he said was less strenuous, and just as though my prayers were answered, this was a totally different route from the rest of the group.Denis and I walked on our own for almost 40 minutes in total silence.My mood was getting better and the terrain was much drier and easier to walk on, allowing my pace to increase greatly. “Madame you are walking fast”.He broke the silence as he looked at me with a smile on his face. He noticed the sudden calm and relaxation on my face compared to an hour earlier. I laughed hard and took out two chocolate bars from my day pack, handed him one and we started to chat. It struck me that we had not engaged in much conversation since the trek begun, other than the usual “madame step here”, “madame step there” “madame you are walking too fast or too slow” or “madame drink some water”. It finally dawned on me that I had not said much to him and I was curious to know all about him. “Call me Lorna not Madame” I said to him…but after various attempts he failed to pronounce my name correctly and so we stuck with “madame”. I asked Denis about his family and I was surprised that he had only one wife and three children. The majority of African men living in remote areas tend to be polygamous with a large number of children. I was impressed to know that his children were in school studying but the conversation became very uncomfortable when I asked how much he earned for his work and he told me he was paid only UGX 10,000 a day (around USD 3). Only USD 3 a day and yet he walked tirelessly with my day pack, holding my hand, encouraging me to keep on moving. He dealt with my tantrums, frustrations and mood swings and always remained calm. I have not met a man with such a calm, patient spirit in a long time. I could tell it was not all about customer care but that he was naturally a very calm man and I doubt he ever got angry in his life. I highly doubt it. As we kept on talking I found myself more and more confused about his financial situation, not only for him but for all the guides, porters and cooks.According to his revelations they all earned very little and it perturbed me. As Denis was my personal guide, I felt a sense of responsibility and asked him to hand me my camera bag. I had hidden some emergency cash just below my camera so I took out a UGX 50,000 note and handed it over to him and then I promised to pay school fees for a term for one of his daughters. This was not because I am rich, far from it, but because I felt a need to step in and brighten his life in a way. Denis´s face brightened up and he was smiling and laughing.He started to talk so fast, and he opened up and told me so many stories that I could barely keep up.His English was not so good and I struggled to understand some of the things he said but I was content he was happy. We reached the central circuit and I was impressed with the pieces of timber that were lined up above the bog, this was just a brilliant idea. I remember stopping to take pictures with Denis, we laughed, we jumped up and down. It was so beautiful gazing at Lake Bujuku.Denis joked about how cold the water was and claimed only the Russians could swim in it. The rest of the trek towards the camp was interesting and I was glad for taking some time away from the group and bonding greatly with him. I dedicate this day of my hike to Denis….It started on such a bad note but he turned it around for me and it ended up really well. The more I read, the more nervous I got. I had been coughing the whole night, had difficulties breathing and at one point during my sleep I felt like I was choking and had to sit up on my bed for almost an hour. I wore five pairs of socks but my feet still felt cold. I noticed some blood when I blew my nose that morning and it was quite obvious the mountain sickness had got to me. I quickly swallowed my tablets and tried to remain calm. I remembered how long I had planned for this trip, the amount I spent on the trip and equipment – almost USD 850 (I would have flown to Mombasa on holiday and back for this amount). I remembered the pressure and expectations of getting to the peak from friends, family and my poor boyfriend who had to bring me a sleeping bag, skiing glasses, a brand new camera, hiking shoes and warm socks all the way from Norway. A trip he was not even part of but had spent a fortune on. All these thoughts ran through my mind and I decided I was going on until I reached the peak. There was simply no way I could give up at this moment. In my mind, I would have failed myself and all the people who were looking up to me. As soon as we were done with breakfast we posed for some photos with beautiful scenery in the background and then went on with the day´s trek. It was a bit of a tough trek, starting off with bog and mud, then rocky and steep terrain. The rocks were giving me a hard time and Denis had to stretch out his hand every now and then to pull me up. I started feeling the fatigue accumulating around my muscles from days of trekking and I could feel the altitude taking its toll as we were elevating fast. We eventually arrived at Ellena Hut exhausted after 5-6 hours and we had very few hours to sleep as we had to be up by 2am to begin the walk up the glacier. Just as soon as we had supper and settled in, we met the guides for a briefing on the do’s and don’t s up the glacier and instructions and familiarization with the axes, crampons and harnesses. I was a bit disappointed as the equipment seemed old, with the crampons appearing rusty and weak, but I was too exhausted to worry about that and retired to bed for the night. We were up by 1am and had a quick breakfast, which enabled us leave by 2am. This was important so we could be up to Magherita and down by 10am. I took a dose of acetazolamide to fight the altitude sickness and as it was still pitch black night time, we all had our head torches firmly strapped on our foreheads as we set off. We finally got to the snowline area, fitted our crampons and practiced walking on ice. It was a tricky at the start but eventually became easier. 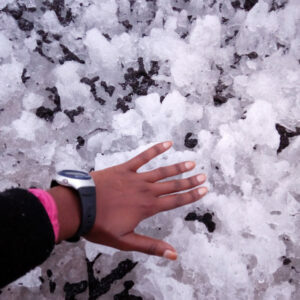 I took some time to hold the ice in my hands just as I had wanted. It was beautiful, spectacular. The views blew me away…..my dream was starting to turn into reality. We climbed up and down a few more steep rocks and finally arrived at the base of the glacier. It was now time to wear the crampons again, get hold of the axes and summit.The moment was upon us. I felt nervous and anxious as it looked dangerous. I was not quite sure how I would get up there, I had never done this before, my emotions were a melting pot of excitement and fear. Denis asked me to stick to him and there was a gentleman behind him whom I shortly followed.It started out well with us pulling ourselves up with a rope until the situation started to slowly get way out of control. The guy ahead of me was slowly slipping down because of my weight on the rope and I didn’t know how to use the axe properly. The guys behind me were yelling at me to get out of the way, making me feel so much anger and confusion targeted towards me. I decided at that point to give up. I remember yelling out to Herbert (the professional mountain guide who was at the base), to kindly evacuate me. I had totally lost interest in summiting. All I wanted to do was to get out of the way.Reaching the summit simply did not matter anymore. It took about 40 minutes for Herbert to reach me and I immediately asked him to take me down. “No madame, you have trekked 6 days to get to this point, I have been watching you, you are a strong woman, follow me and we will get to the top” The rest is history. I will forever remain indebted to Herbert, for being extremely professional and encouraging at my weakest moment. I pulled myself to the top, took amazing photos on the Magherita and was very proud of myself. I was glad that, despite of the negative energy derived from the group, there was one positive person at that crucial time to make my dream come true. Coming down the glacier was a lot of effort as well and I remember breaking down into tears at some point as I was exhausted, fatigued and dehydrated. Herbert didn’t look so well either.My crampons came off so many times that I nearly gave up and opted to spend a night on the glacier. Herbert never gave up on me and I remember us reaching down to the base of the Glacier at 7pm. We had spent almost 12 hours struggling to go up and get down and this is not recommended at the glacier as it’s risky. We arrived back at the camp by midnight and I was totally devastated and torn. The challenge of Portal Peak was now remembered fondly as not so challenging in comparison. I had dinner, didn’t bother to have a shower and almost instantly fell asleep. The trek down was really painful as my legs were hurting from the previous day. I walked really slowly with Denis as I was exhausted, so we maintained a really slow pace. I spent most of the day taking pictures and wishing to get out of the mountain. The trek took approximately 7 hours but we continued to bond as usual until we arrived at the camp. I was not comfortable being around the group after all that had transpired at the glacier, so I had my supper in silence and spent most of my time outside speaking to the guides. I went to bed early and asked Denis if we could wake up as early as 5 am before the others so that I could leave. I was up at 4am, packed my bags, woke Denis up with one more guide and we were off on our own. This was one of the best days asI knew I was finally going home.It was also relaxing for me because I was away from the group. We cracked jokes, laughed, finished up my chocolates and we were later joined by two of the other porters who were carrying my heavier bags.We all walked joyfully until we arrived at the exit gate. I have never felt so relieved to be back to civilization. I quickly signed out as I waited for a boda-boda to pick me up and transport me to the Sandton hotel in Kasese town. It was very emotional for me to say good-bye to all these lovely people who had carried my bags, guided my walk and supported me in achieving what I had set out to do. They felt like family and we exchanged contacts and bid each other farewell. I was so emotional and I wanted to cry so much. I wished I could offer them a better life and I felt they deserved a much more rewarding pay for their efforts. 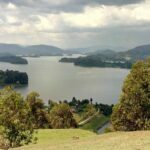 As I work for a tour company, I promised to recommend them to any of my clients or friends who would wish to trek the Rwenzoris. The Uganda wildlife Authority and Rwenzori’s Mountain National Park management sent one of the guides to come up to the Sandton hotel where I was resting and awarded me with a certificate of appreciation. This made me very happy, to think that despite of all that I went through, my efforts were recognized and appreciated. What an amazing feeling! One lesson well learnt from my experience is negative people and negative energy are dangerous in our lives. We should always try to surround ourselves with positive people especially during strenuous or difficult situations. I forever remain indebted to Herbert, Denis, Hannington, Robert and all the guides, cooks and porters who work tirelessly to ensure we have a safe, enjoyable trek yet earn very little in comparison to the job they do and the risks they face. It is my wish that one day I will be in a position to transform their lives and ensure what they earn is relative to what they are truly worth.